The age-old Southern debate continues! I have always said pe-cahn. That’s the way my family pronounces it and has pronounced it for generations. So I think I am right! When we started publishing Cooking with Paula Deen, Paula told me that her family pronounces it correctly, just like other families do in Georgia: peee-can. Which is it for you? Actually, it really doesn’t matter to me as long as there is a delicious pecan treat following the conversation. Who doesn’t love pecans? My grandparents had pecan trees growing on their farm and I looked forward to the annual pecan picking every year. It was fun picking up pecans that had fallen to the ground and then trying to break open the hard shell. Dad usually got the job of shelling the pecans after we picked. When they were all shelled, he would roast the pecans in the oven for us to enjoy. He would put a little butter, garlic powder, and a dash of Worcestershire sauce on them and toss gently to mix. Then the nuts were put on a baking sheet to roast slowly until golden brown. Wow, I can still remember that treat. Pecan treats are the best, and we have a fabulous new book I adore completely dedicated to them. 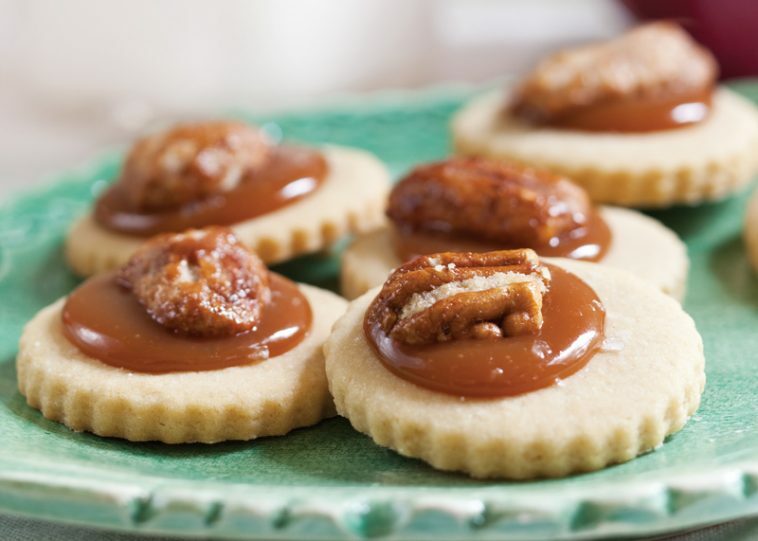 Our new Tiny Book of Pecan Favorites has more than 75 recipes of delicious pecan dishes. 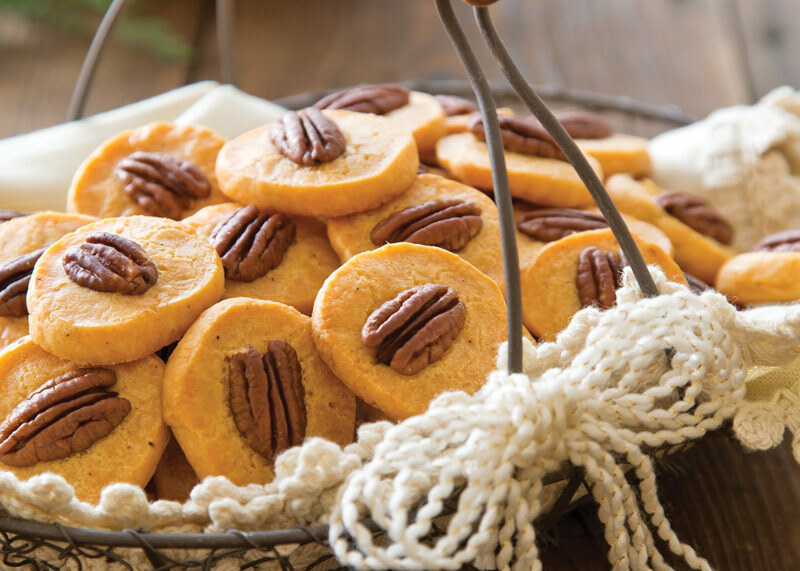 From breads, desserts, snack mixes, and sides, this collection includes sweet and savory choices like these Spiced Pecan Cheese Coins, so there’s something for everyone! You’ll have fun making these recipes—and hey, they might even become your new favorites. We all know pecans are great on top of sweet potatoes, tossed on cakes and salads, and in the classic pecan pie, but these creative recipes find ways to use them you might not have thought about. You’ll fall in love with our Tiny Book of Pecan Favorites, so order a copy and get some copies for your family and friends too! Whether you pronounce it peee-can or pe-cahn, you’ll love these recipes during the holiday season. 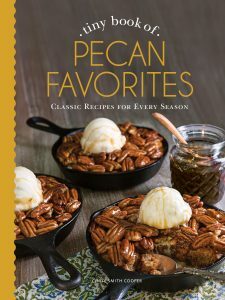 Tiny Book of Pecan Favorites is available for purchase in our online Hoffman Media store! Get free shipping until November 5th by using the code: PECAN. What’s your favorite pecan dish? From the Deep South, Savannah, pee-cans used for luscious sweet potato casserole (or Sweet Potato Surprise) topping, and pies. My dear friend in Mississippi, calls them pe-cahns, but we still enjoy eating them while visiting each other, regardless of our different pronunciations! Love this post. Definitely pe-cahn was how I pronounced it most of my life. However when we relocated to NC I was quickly corrected to the “proper” pronunciation. I remember going to the Farmer’s Market asking for Peonies. Every vendor looked at me with puzzlement. Then one realized what I was asking for, Pee-Oh-Nees!! Love the South!!! 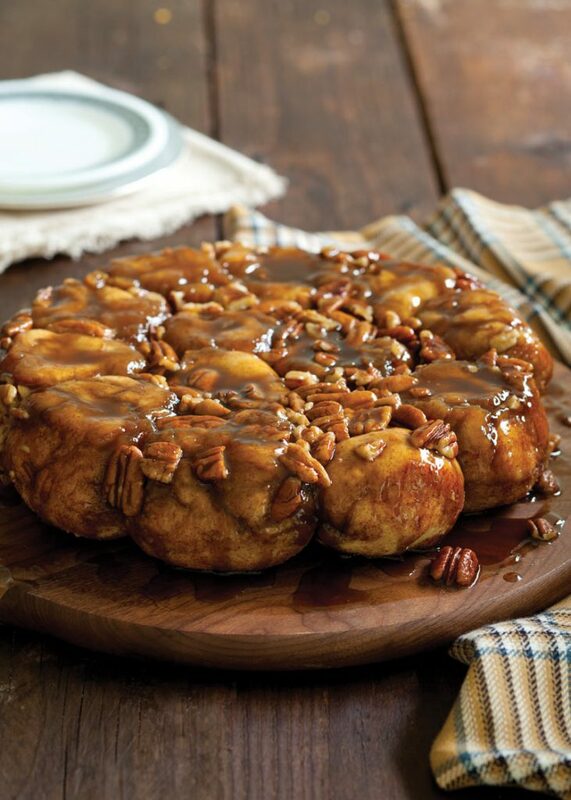 Fav Pee-Can dish has to be gooey pecan rolls! I have lots of huge Pee-can trees in my yard. We all have fun racing the squirrels to the awesome nuts and laughing about that on Thanksgiving Day over pie. This year we had ample rain and rain equals pee-cans! Hey, Teresa from Charleston: I’m not far from you in SC pee-cans “R” us. I’ll add my central Missouri version to the list! Around here most people pronounce it as pa-kon (short a). It has been my pleasure to bake 2-4 pecan pies for Thanksgiving dinner every year since 1965. I always carefully lay the pecan halves rounded side up in concentric circles around the top of the filling. I have taken lots of kidding about it through the years, but virtually no one refuses to have a slice with homemade whipped cream! Oh, my!! An entire recipe book devoted to pə-cahns!! Genius!! My family home is surrounded by pə-cahn trees. When I was growing-up, Daddy would only feel justified to sit down on Sunday afternoon to watch a Cowboy game if his hands were busy shelling peas, beans or pə-cahns!! Of course, Mother certainly didn’t want to use broken halves in her delicious pies; thus, those ‘pieces’ were fair game to anyone watching with him. Thank you, Phyllis, for helping us to once and for all educate our fellow Southerns as to the correct pronunciation of this delicious treat! My family all called them pe-cahn. Here in Texas, that is what everyone I knew called them when I was growing up. We have lots of pecan orchards here in almost every area. My grandparents were all East Texas farmers and we had lots of pecan and walnuts around that area. I have always been a big fan of most anything pecan especially pralines and pecan pies. I beg your pardon. Be careful with your words. I’m from Charleston, the heart of Southern, in my humble opinion, and it’s always been pee-can. MANY in rural North Carolina say PEE- CAN. Since I am your cousin, of course I say pe-cahn. They really are one of the best nuts. Pee-Cans are what soldiers put under their beds to use in the middle of the night when they had to go to the bathroom! Only Yankees and Northwesterners say PEE-can. Southerners always pronounce pe-CAHN. Either way, I LOVE ’em!! Pe-cahns also have a great memory for me. After a storm blew over two old China berry trees my Daddy replaced them with two pecan trees. I believe they were the Stuart variety. He was careful to fertilize them each year, however, they only bore much of a crop every other year. I remember a few years we had to actually stoop down and rake them toward us filling large paper grocery bags which we sold to a nearby store. I especially remember the wonderful way he would toast the halves in the oven with butter and salt. After he passed away we found 5 one gallon jars of shelled pecan halves in the freezer. What a treat and oh how I miss those. I also pronounce them as pe- cahns. Growing up my mother never used pecans, only walnuts, hazelnuts,and almonds. But I just love them and use them not only in my baking, but in savoury dishes too. I always toast them just a bit in the oven before I use them in a recipe. This book looks great!! I always make by nut crescent cookies using pecans and add them to my all time favourite pumpkin muffins!